Introducing the most unique and innovative artist in Country Music today, J.C. Country Soul. Born Jessica Cannon, lovingly known by friends and fans as “J.C.”, Jessica is an aspiring country artist, performer, singer/songwriter from Covington, TN. Surrounded by Memphis blues, R&B, and gospel as well as Nashville’s country music scene, J.C. realized her love of music at the age of 12. Over the next fifteen years, J.C. honed her vocal and songwriting abilities to stretch across multiple genres finally finding her niche within Country Music. Her professional performance background includes local and national exposure in various scenes, but not limited to, churches, charity events, community events, open mic nights, songwriters events, talent shows, national business conventions, various Republican and Democratic political functions television and more! Her passionate delivery and intense stage presence can only be described as electrifying. J.C. is a living testimony to the American ideal that if you dare to dream it, you can do it! J.C. represents a new generation and a previously untapped market within the country music industry. 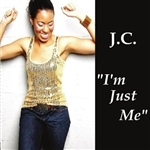 J.C.'s debut album entitled "I'm Just Me" was released OCTOBER 19, 2010! !